I am sure that everyone has been anxiously awaiting this news. Following some valuable and valued input; following the testing and weighing of several possibilities; following deep thought and careful reflection, I have decided for a name for my new abode. At times this seemed a difficult decision. One that might not ever be made. But then, suddenly, things crystallized. It became clear that for all the good options, for all the creative possibilities, there is only one choice. As clarity snapped into focus, peace descended. There is a practical reason that this is the only name. I have realized that it is the name I am going to call where I live. Whatever other name I might try to apply to the place, I will call it the Shire. I have already found myself doing that. Why fight it? It is what is. In usage, there will be the Shire West (Louisville) and the Shire on the Hudson (Manhattan). Tricia arrived in New York today for a variety of work-related events. They start tomorrow. This was a day to explore. While waiting for her, I made my way to the dry cleaner and managed to figure out a way to identify which key opens which lock. When she arrived, we walked to lunch at Ajanta – good stuff, definitely a place to return. An effort to visit Riverside Park failed when the entrance that we selected was closed. We did see the Hudson from a distance and New Jersey from an even greater distance. Our explorations then took us north to visit Fairway Market. 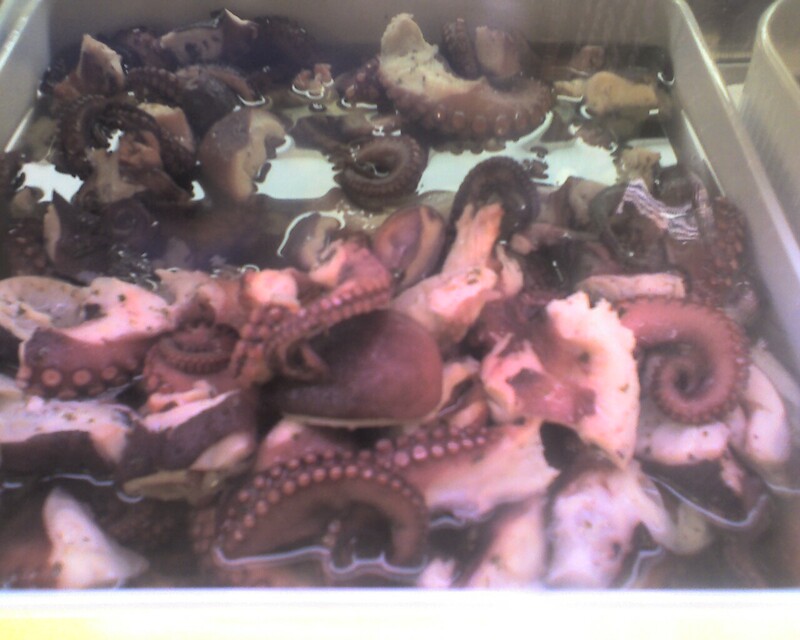 Quite an experience – even though they exploit octopi. While wandering, we connected with a friend of Tricia’s brother. He was doing a music show at the Atria Senior Living Community. We went and checked that out. He took us to dinner at Hampton Chutney – we ate dosa (light crispy, sour-dough crepe made from rice) for the first time. Another keeper. The evening was gorgeous so we walked up Broadway from 83rd to La Salle. Oh yeah, I bought a large screen LCD TV in there too. A good day. With 22,217 steps – even though I did not get to the gym. It has been a long time since I have attended a Halloween party. I did so tonight, joining nearly 200 adults and children to celebrate the sixtieth anniversary of Trick-or-Treat for UNICEF. In the sixty years since those orange cartons (decorated milk cartons were first used) have been used by children and adults to raise almost $160 million dollars. Those funds are used by UNICEF to provide food, medicine, and education to help children thrive. Monroe Allison, his wife Dianna, and UNICEF Jenny (all shown in the picture) attended the event to be recognized for his parent’s vision. Monroe attended the 219th General Assembly (2010) where UNICEF gave thanks for the role of his parents and the Presbyterian Church (U.S.A.) in creating and promoting Trick-or-Treat for UNICEF. By participating in Trick-or-Treat for UNICEF, Presbyterians serve in the global neighborhood as disciples of Jesus who calls us to love one another. 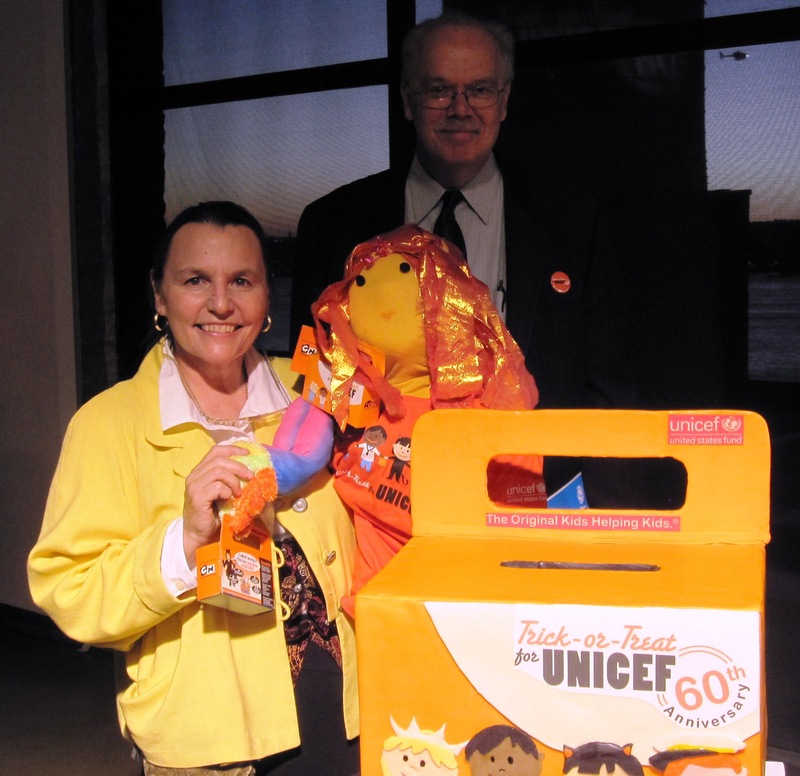 The Office of Child Advocacy provides a bulletin insert on Trick-or-Treat for UNICEF in color and in black and white. Download Trick or Treaf for UNICEF story about the Allisons and the origins. Find the resources needed to Trick or Treat for UNICEF. I have not been posting as often as I hoped. I am still fighting with a cold. Of course these foci are essentially and inextricably intertwined as events today affirmed. A group of about twelve Presbyterians from Wellshire Presbyterian Church in Denver, Colorado visited the office this morning. They were the first group of Presbyterian visitors that I had the privilege and joy to host. As the Presbyterians from Denver gathered in our large conference room, a delegation of church leaders from Sudan met in our small conference room. The Presbyterian Ministry at the United Nations helped with their visit based on long-standing Presbyterian involvement with our Sudanese sisters and brothers in Christ and on many statements of the General Assembly calling Presbyterians to work for and pray for a just peace in Sudan. The Rev. Ramadan Chan, Secretary General of the Sudan Council of Churches, graciously agreed to speak with the Wellshire group. He shared about the concerns that he and his colleagues share for their beloved country and the impending referendum in southern Sudan. He reiterated their view that violence and war might break out but it is not inevitable – that peace is possible if the nations of the world act swiftly and decisively to support peace and a fair and transparent referendum. The Rev. Chan explained that he and the other church leaders from Sudan had two primary purposes for their visit. The first is to sound the alarm. They have done that in London with leaders of the United Kingdom. They are doing that in New York with the international community through meetings with Secretary General Ban-Ki Moon, national missions at the United Nations, and international organizations and programs. They will do that in Washington, DC next week with leaders of the United States. Their second purpose is to meet sisters and brothers in the churches of the United States – so we will know their story – we will hold them in prayer – we will advocate with our government. When the Rev. Chan had finished, we joined in prayer led by the Rev. Chan and the Rev. Patricia Kitchen of Wellshire Presbyterian Church. The Rev. Chan then left for a lunch engagement. We talked a bit more about the Presbyterian Ministry at the United Nations and about ways that our lives as disciples of Jesus intersect with the work of the United Nations . . . through the season of prayer for Sudan, prayers for United Nations Day, participation in Trick-or-Treat for UNICEF, and the Red Hand Campaign to end the use of children as soldiers were discussed. Our time ended with an invitation to Wellshire Presbyterian Church to return for a seminar at the Presbyterian Ministry at the United Nations. Looking forward to that day! Photos by Ricky Velez-Negron of the Presbyterian Ministry at the United Nations. Spectacular thunderstorm this evening – marveling at it and worrying about those who are in it. Listened to Monday Night Football on Field Pass. Today marks the beginning of a new adventure. In just a few hours I head for New York and a new job. 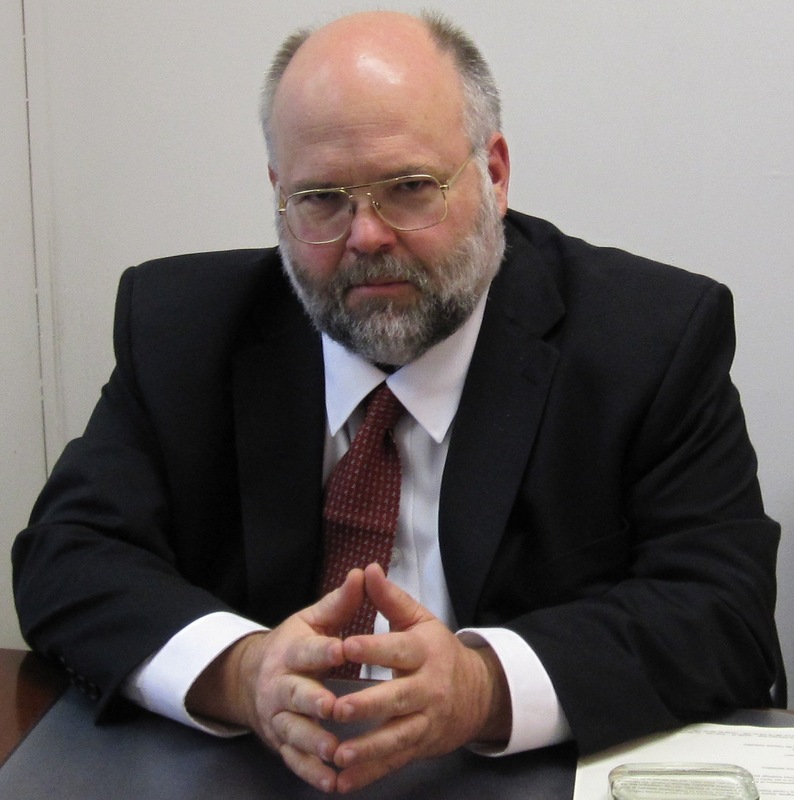 I will be serving as the director of the Presbyterian Ministry at the United Nations. It will be a learning experience to figure out what that means – a learning experience that will happen at a fairly rapid rate. I will be living in a church-owned apartment in Morningside Gardens near Riverside Park. I will be wearing a suit a heck of a lot more. Actually I have done that for five days in a row last week. Not sure when that has happened before. Today marks the beginning of a new effort at self care. That has not gone so well over the past month or so. But this is a new start. Much more walking will be required in New York City. I am counting on that to help, but intentionality will also be required. Today marks the beginning of a new attempt to blog more regularly – at least to make notes of what happens and how the days go.